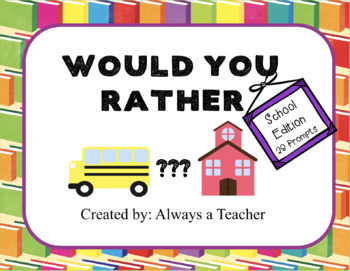 Would you rather: struggle to have students respond to prompts or have students excited to respond to school themed prompts? 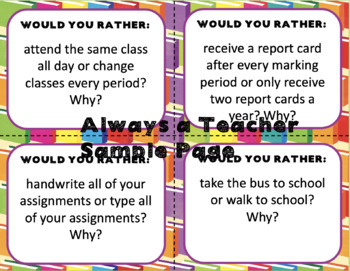 These 28 school themed prompts can be used in multiple ways!! Use them for writing prompts, a quick class survey, ice breakers, conversation starters, turn and talks, fun debate topics, and many more ways!! 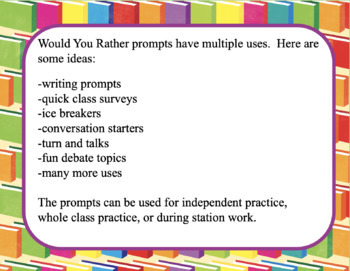 With 28 prompts, each student can have his/her own prompt for independent practice, you can use one prompt for the whole class, allowing for 28 days of prompts, or the prompts can be used during station work throughout the month.